No more glue spots, smudges, tears and messy fingers! - Stays on, yet is easily removed. - Repositionable - easily fix crooked papers or change your wallpaper - even after your project is complete! 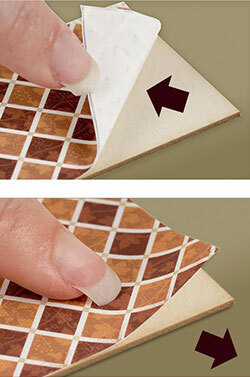 - Just peel off the backing and apply the paper-like fabric to your walls, floors and ceilings. - Premium wallpaper has a very fine, fabric texture. Does not stretch like fabric. - Perfect for small spaces and curved walls. The small scale designs work well for quarter scale (1:48) and half scale (1:24). Some of the smaller prints may also be appropriate for using in micro scale (1:144). The designs could also work for small patterns in 1" scale (1:12).